Quinoa is a gluten-free super grain that has been gaining a lot of popularity over the last few years. While it looks very similar to the pearl millet easily available in India, I don't believe there's an Indian name for quinoa or that it's locally produced. 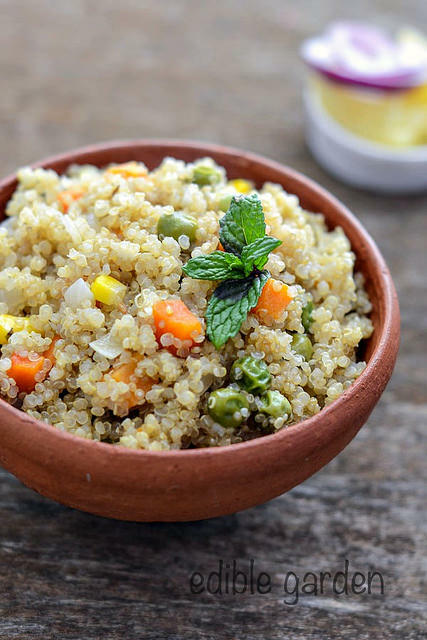 Quinoa pulao makes a great lunchbox recipe since it doesn't dry out as much as rice pulao tends to. 1. Heat the 2 tablespoon oil in a pan, preferably non-stick. Add the cumin seeds and when they sizzle, add the whole spices - cinnamon, cardamom, cloves, bay leaf. Fry for 10 seconds and then add the chopped onions. Fry until just soft (about 3 mins) and then add the ginger and garlic. Sautè until fragrant - about 2 mins. 2. Add the vegetables now, along with finely chopped coriander or mint leaves (if using). Sautè for 4-5 mins until the vegetables are almost cooked. 3. Add the 1 cup quinoa to this. 4. Check your quinoa package to see recommended amount water needed to cook it. There are different varieties and I am assuming they have differing lengths of cooking time. I have only cooked with white quinoa and the method I follow is to add double the water. So 1 cup quinoa gets cooked in 2 cups water and that's how much I added. 5. Add salt and bring this to boil. Then lower heat to simmer and cook covered for about 5 mins. Check in between to make sure there's still water in the pan and the quinoa or vegetables is not burning. Ensure heat is at a minimum and you should be fine. The quinoa will fluff up quite a bit on cooking and in about 5-6 mins, you should have very soft and fluffy quinoa. The rest of the vegetables should be done now too. Add more coriander leaves if desired and serve hot. Will Eating at Night Make Me Gain Weight?